With 21 hours to go now, the #5 Mustang Sampling Action Express Cadillac leads the race, Joao Barbosa out front, ahead of the hard-charging #22 ESM Nissan of Pipo Derani. 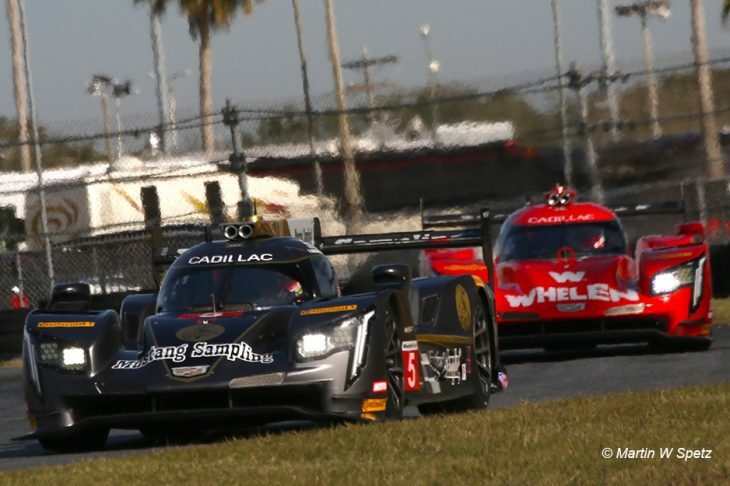 This after the Spirit of Daytona Cadillac charged to the front, Tristan Vautier getting past, but was unable to forge a lead over Filipe Albuquerque during the second hour. It was an eventful couple of hours following the opening stint, with lots of battles up and down the order, and multiple issues for some key teams. Completing the top three is the #10 Wayne Taylor Racing Cadillac, Ryan Hunter Reay in the car for his first stint after Renger Van Der Zande took the start. 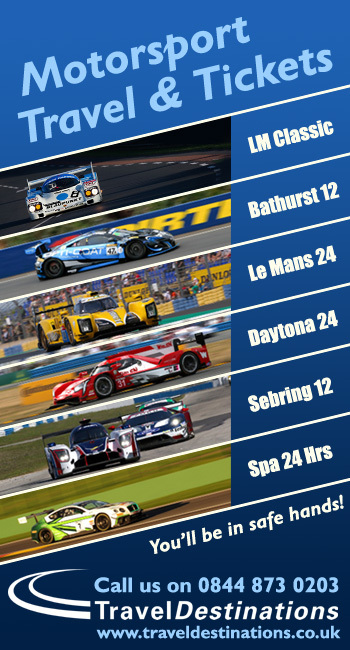 Just outside the top three is the #6 Acura Team Penske of Simon Pagenaud, ahead of the #90 Spirit of Daytona Cadillac. 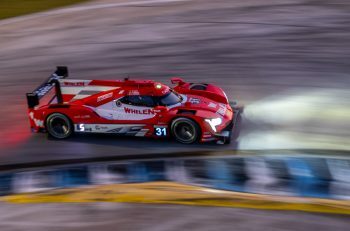 Fifth was the #31 Action Express Cadillac, Stuart Middleton aboard for his first Rolex stint, the Sunoco Challenge winner looking good, and in the mix for a top three spot heading into hour four. Elsewhere in the class there was drama for the #55 Mazda, the car, in the hands of Jonathan Bomarito losing a wheel on the infield, continuing round slowly to pit, the wheel ending up against the armco. Harry Tincknell was installed as the team attended to the issue. The sister #77 Mazda, in the hands of Oliver Jarvis meanwhile, also lost time, dropping behind the leading GTLM cars after a long pit stop. Later, Jarvis then stopped in the pitlane, the Joest crew attending to push the car to its pit stall. Diana Binks for IMSA Radio hearing from Oliver that the car was suffering with a downshift issue. There was trouble too for #7 Penske Acura, Ricky Taylor pitting with the left hand door open, the latch apparently broken, the car is now running eighth, and crucially still on the lead lap. And finally, the Performance Tech ORECA also ran into trouble, causing the first Full-Course Yellow after James French ran out of fuel on the banking halfway through Hour 3. In GTLM, the #66 Ford still leads, a monster stint by Joey Hand coming to an end in Hour 3, the American handing over to Dirk Muller. Behind the two Corvettes still make up the top three, unable to keep up with the lead car on pace, the #3 of Antonio Garcia leading the #4 of Tommy Milner. Best of the rest is the #63 Risi Competizione Ferrari, which had a small issue with the door hinge during the first Full Course Yellow. The #911 Porsche sits fifth. In GTD the pit stops during the full course yellow helped cycle the #33 Riley Motorsports Mercedes-AMG to the front. Ben Keating did the opening hours, and moved that car into the top five before handing it over to Luca Stolz during the FCY. The 2017 Petit Le Mans winning Montaplast by Land Audi R8 LMS was in second after three hours, Sheldon Van Der Linde started the car and then handed the reins to Christopher Mies who held onto a comfortable lead up until the FCY bunched the field together. Third in class is the #86 Michael Shank Racing Acura NSX GT3, currently driven by Katherine Legge, that car, like much of the GT Daytona field have completed three pitstops. Both the #15 and #14 3GT Racing Lexus’ RCF’s were at the front of the GTD field, but were sent to the back before the race returned green for reasons still unclear. Those cars currently in eleventh and twelfth, the #15 of Jack Hawksworth leading the #14 of Kyle Marcelli. The only major drama in the class occurred in the pit lane when the #82 Risi Competizione fire caught fire in the box. Santiago Creel, who was on board at the time was able to safely escape from the car. The car would eventually return to the race. News from the team is that they believe the fuelling rig had a fault, some fuel still flowing after the nozzle was withdrawn – a flash fire the result. The car lost 24 laps as a result. Just before Hour 4 began, the #58 Wright Motorsports Porsche finally got going after its incident on the warm up lap. 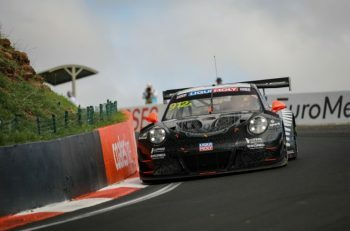 Robert Renauer was due to start the car but a suspension failure on the warm-up lap sent the Porsche 911 GT3 R into the wall at the kink. The damage was repaired and the car was sent back out, and is currently 75 laps down.